It is evident that the mock-epic novel is not just spinning a yarn and cannot be content with the language appropriate to a plain tale. The difficulties of Ulysses and, very much more, of Finnegans Wake are not so many tricks and puzzles and deliberate obscurities to be hacked at like jungle lianas: they represent those elements which surround the immediate simplicities of human society; they stand for history, myth, and the cosmos. Thus we have not merely to accept them but to regard them as integral, just as the stars overhead are integral to the life of the man who, micturating in the open air, happens to look up at them. As a composer Burgess is sensitive to Joyce’s talent for music and how he infused his writing with its qualities. I also like the natural metaphors Burgess employs: the jungle lianas and the person peeing outdoors at night. There seems to be a great deal of dream-literature in existence – the dream was a popular literary convention in the Middle Ages, for instance; two of the world’s best-loved books, Pilgrim’s Progress and the Alice diptych, recount dreams – but […] there is usually very little of the true dream about it. Bunyan’s book is a waking allegory, as is The Pearl or The Visions of Piers Plowman. Genuine dream-stuff is, before Finnegans Wake, to be found perhaps only in Alice, Clarence’s big speech in Richard III, Kafka (though he presents less dream than sick hallucination), Dostoevsky, and the Bible. Joyce is the only author who has tried, in a work of literature as opposed to a work of science, to demonstrate what a dream is really like without making any concessions at all to those who will accept a dream as a literary convention, an intermission between waking states, or a bit of fanciful garnishing, but not as the whole essence of a work of epic proportions. Thus, when the classical critics turn on Finnegans Wake the beams of their bull’s-eye lanterns, they see something unique, unsubmissive to their waking rules, and hence to be condemned for what it does not pretend to be rather than appraised in terms of what it is. They denounce night because the sun is not shining; they upbraid the eternal because their watches cannot time it; they produce their foot-rules and protest that there is no space to measure. Our educational tradition, both in Britain and America, has conditioned us to look on words as mere counters which, given a particular context, mean one thing and one thing only. This tradition, needless to say, is geared to the legalistic and commercial rather than to the aesthetic. When a word is ambiguous we are uneasy, and we are right to be uneasy when that word is set in a contract or official directive. But the exploitation of the ambiguity of a word is, as Professor Empson has been pointing out for a long time, one of the joys of the literary art. […] When life is freed from the restrictions of time and space, as it is in dreams, the mind makes less effort to sort out contradictions, or gentler ambiguities, and a word may ring freely, sounding all its harmonies. This free ringing, in a zone of psychological experience which has all the doors open, may well set jangling all the phonetic and etymological associations which the mind is capable of accommodating – foreign languages not taught in public schools, songs little known in the great world of singing, scraps of conversation almost forgotten, dead slogans, posters long torn from their walls. Joyce was psychologically right in refusing to limit the associations of dream-words to what some abstract image of a reader or critic could most easily take in. In throwing vocables of great, though arbitrary, complexity at us he was being true to his principle of artistic communication. Paradoxically, when an essential word or phrase in a book about a dream is least intelligible, then it may be most intelligible. This entry was posted on Monday, January 4th, 2016 at 2:49 pm and is filed under books, literature, words, writing. You can follow any responses to this entry through the RSS 2.0 feed. You can leave a response, or trackback from your own site. I have had ReJoyce on my bookshelf, unopened, for about fifteen years. I have books that mock me. And this blogpost has joined the chorus, for which I apologise. But if you’ve read the excerpts, you can now claim to have read part of Burgess’s book, which counts for something. Hey! That’s true, Stan! Thanks! Fascinating, I had no idea Burgess had such a strong relationship with Joyce’s work.. His ‘Re Joyce’ looks interesting also. Claire: He also created an abridged version of Finnegans Wake – no mean feat! Re Joyce and Here Comes Everybody are the same book, just different names for different geographical editions. Oh ok, that wasn’t clear from what I was looking at. Good to know! And that abridged work – fascinating. Thanks! 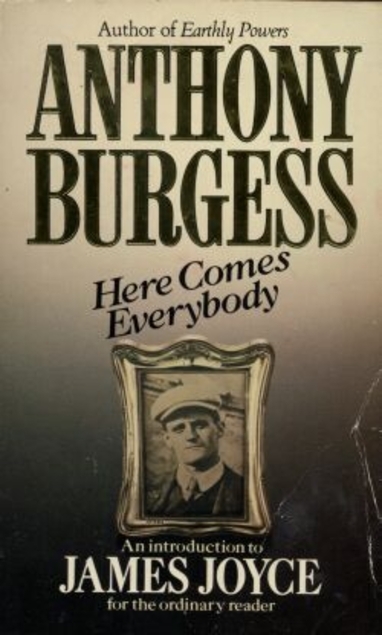 I scanned the Burgess book years ago whilst studying Joyce at Uni must look out for a copy.